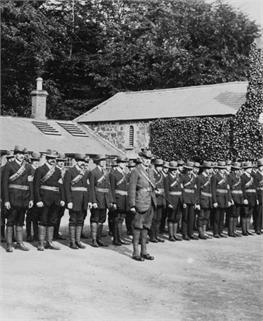 The Ulster Volunteers were first formed in late 1911, early 1912. They were intended as local militia to provide an armed resistance to Home Rule. In January 1913 they officially became the Ulster Volunteer Force (UVF). The Young Family, along with other prominent Ballymena Unionists, realised that they needed to play a central role in the organisation of a local militant force. The Young Family bankrolled the local Ulster Volunteers paying for uniforms and other equipment. Other prominent local Unionists like Sir Arthur O'Neill, Robert Orr and General Sir William Adair provided invaluable military experience.